Biography: Darren Shahlavi was part of a generation of British martial arts actors who found success in both the Chinese and American film industries. He was born in Stockport, UK, to Iranian immigrant parents. He trained in judo from the age of seven and later studied kickboxing under Ronnie Green and Shorai Association Karate under Dave Morris. He later studied at Master Toddy’s Muay Thai Academy in Manchester. Shahlavi grew up watching Bruce Lee and Jackie Chan films, and as a teenager he contacted Hong Kong cinema expert Bey Logan, who invited Shahlavi to a seminar in London where he first met Donnie Yen. Bey Logan noticed Shahlavi’s potential and hired him as an assistant on the Phillip Ko film Guns and Roses (1993), where Logan acted as associate producer. Shahlavi had a small part in the film and had a brief fight scene with Simon Yam. At the age of 17, Bey Logan arranged for Shahlavi to move to Malaysia to star in a feature film and work alongside fellow British martial artist and fight choreographer Mark Houghton. Due to a lack of funding, the film was never made. Shahlavi continued to work in Malaysia as a stuntman for Houghton before relocating to Hong Kong to pursue a career in action films. He had several small roles in films like Angel on Fire and Deadly Target for Phillip Ko, and supplemented his acting income with other work including a stint as a bodyguard for Kim Maree Penn’s Signal 8 Security firm. He was also head doorman at three nightclubs in Hong Kong. In 1996, Shahlavi was hired for the role of the villain Smith opposite Jacky Wu Jing in Yuen Woo-ping’s Tai Chi Boxer. The film caught the attention of Ng See-yuen at Seasonal Films and the director Tony Leung Siu-hung, who cast Shahlavi as the villain in the Hong Kong-US co-production Bloodmoon (1997), starring fellow British screen fighter Gary Daniels. The film was his ticket back to the US where he continued his acting and stunt career in film and television roles. He worked on studio films in Hollywood including a role as a boxer opposite Eddie Murphy in I Spy (2002), and stunt work on The Chronicles of Riddick (2004), Night at the Museum (2006), 300 (2006) and Watchmen (2009). Shahlavi also made inroads into other genres, most notably working in Germany with horror filmmaker Olaf Ittenbach on the films Legion of the Dead (2001) and Beyond the Limits (2003). He worked with the German director Uwe Boll on the films BloodRayne (2005) and In the Name of the King: A Dungeon Siege Tale (2006). In the latter film he played Ray Liotta’s stunt double and fought on-screen with Jason Statham. Following discussions with Hong Kong-based producer and casting director Mike Leeder, Shahlavi was chosen to play the British boxer Twister in the Wilson Yip film Ip Man 2 (2010), opposite Donnie Yen and Sammo Hung. In an interview with HKCinemagic, Shahlavi described working on the film as “one of the most relaxed and enjoyable sets I’ve ever been on”. 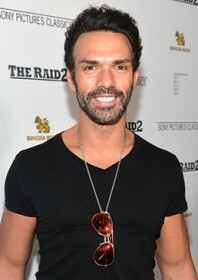 Shahlavi subsequently worked in more action roles in the US, including films opposite Steven Seagal in Born to Raise Hell (2010) and Dolph Lundgren in The Package (2013). He was cast as the role of Kano in the TV series Mortal Kombat: Legacy (2011), and enjoyed further success on television with the shows True Justice and Arrow. In 2012, he made his leading man debut as Aladdin in the TV movie Aladdin and the Death Lamp. Towards the end of his life, Shahlavi had started to work with Jean-Claude Van Damme. He had completed Pound of Flesh (2015) and was working with Van Damme on the remake of Kickboxer, called Kickboxer: Vengeance (2016), when he died of a heart attack at the age of 42. Speech! “I’ve got friends that way back then said to me, ‘You’re really lucky knowing exactly what you want to do with your life. You want to be an actor, (and) do martial arts movies’. And I didn’t really think about it until recently, but for the past 20 years I’ve been doing what I’ve always wanted to do and I’ve never had my mind elsewhere or thought about doing anything else. It’s just a tribute to really connecting with martial arts films and the actors that play in them.” Interview with Eastern Kicks, 2011. Filmography (as actor): 1991 The Turbulent Affair; Hero’s Blood; 1993 Guns and Roses; All New Human Skin Lanterns; 1994 Deadly Target; 1995 Angel on Fire; Only the Strong Survive; Sixty Million Dollar Man; Guardian Angels; 1996 Tai Chi Boxer; 1997 Bloodmoon; 1998 Techno Warriors; 1999 Lethal Combat; Hostile Environment (+ action dir. ); 2001 G.O.D. ; Legion of the Dead (+ action dir. ); Xtreme Warriors; 2002 I Spy; 2003 Sometimes a Hero; Beyond the Limits; 2004 Jiminy Glick in Lalawood; Summer Storm; The Final Cut (TV); The Survivors Club (TV); 2005 Alone in the Dark; BloodRayne; 1-800-Missing (TV); 2006 Slither; 300; Merlin’s Apprentice (TV); 2007 Reaper (TV); In the Name of the King: A Dungeon Siege Tale; Alien Agent; Bionic Woman (TV); Intelligence (TV); 2008 Sanctuary (TV); 2009 Watchmen; Smallville (TV); Human Target (TV); 2010 Ip Man 2; Born to Raise Hell; 2011 Metal Hurlant Chronicles (TV); Mortal Kombat: Legacy (TV); Red Riding Hood; Tactical Force; 2012 Aladdin and the Death Lamp (TV); True Justice (TV); Borealis (TV); Arrow (TV); 2013 The Package; The Marine 3: Homefront; Big Thunder (TV); Survival Code (TV); 2014 High Moon (TV); 2015 Pound of Flesh; Tomorrowland; Kickboxer: Vengeance.